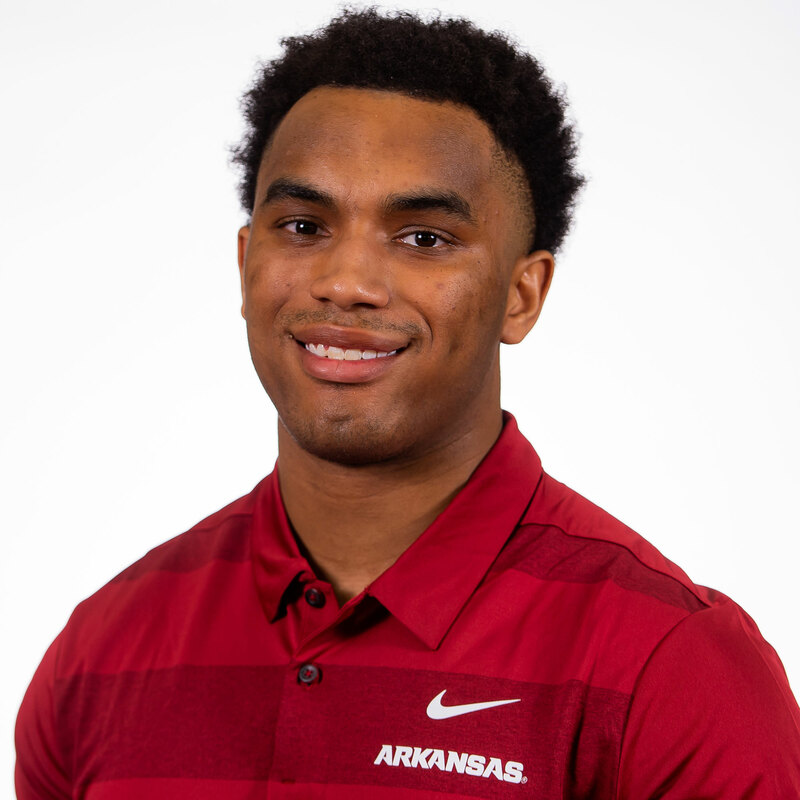 2018 (SOPHOMORE): Played in all 12 games for the Razorbacks as a sophomore in 2018 … Totaled 220 snaps over the course of the season, including 214 out of the backfield, also lining up six times in the slot and out wide, according to Pro Football Focus … Ranked third on the team in rushing, racking up 251 yards on 57 carries, averaging 4.4 yards per rush, with a touchdown … Also hauled in 11 passes for 61 yards, going for a clip of 5.5 … Recorded 55 yards on 11 carries in week two at Colorado State … Picked up four or more carries in each of the first four games … Rushed the ball a season-high 12 times for 30 yards against Ole Miss on Oct. 13 in Little Rock … Racked up a season-high 70 yards on five carries vs. Vanderbilt, scoring on a 38-yard run in the second quarter to tie the contest at 14 … It was also his longest rush of the season … Caught a 2018-best five passes against the Commodores, racking up 17 yards in the process … Had a season-high 26 yards on two catches vs. Alabama on Oct. 6 … Effective in pass protection, recording grades over 72.0 from PFF in eight games, with a season-best of 82.1 coming vs. LSU on Nov. 10 … Helped the Arkansas offense to 4,028 yards of total offense and 28 touchdowns, including 1,721 yards on the ground and 2,307 through the air. 2017 (FRESHMAN): Played seven games and was third on the team in rushing yards (326) … 326 rushing yards was tops on the team before an injury in the seventh game of the season that sidelined him for the rest of the year … Rushed for four touchdowns, which led all SEC freshmen before the injury … Found the end zone on the ground in three games … Longest run was 40 yards … Averaged 5.3 yards per carry … Logged one 100-yard rushing game, 120 yards on 14 carries in his collegiate debut … Had 17 runs for a first down, nine for 10-plus yards and a pair for 20-plus yards … vs. Florida A&M (Aug. 31): Rushed for a game-high 120 yards and one touchdown on 14 carries in leading the Hogs to a 49-9 win in the season opener … Became one of only three Arkansas true freshmen to rush for 100 yards or more in his Razorback debut, joining former standouts Alex Collins (2013) and Felix Jones (2007) … His 120 rushing yards tied for fifth-most in the SEC in Week 1 and are the 14th most by a true freshman in Arkansas single-game history … Was one of seven FBS freshmen to rush for over 100 yards in Week 1 and one of just two true freshmen to do so and the only true freshman player in the FBS to rush for over 100 yards and score a TD in Week 1 … Five of his 14 runs went for 10 or more yards – tied for most by an SEC player in Week 1 … Half (7) of his runs in the season opener went for a first down … Six of his last eight runs against Florida A&M resulted in a first down or touchdown … vs. Texas A&M (Sept. 23): Posted a team-high 77 rushing yards and one rushing touchdown on 13 carries … vs. New Mexico State (Sept. 30): Scored twice on the ground and finished with 48 yards on 12 attempts … Became the first Arkansas true freshman running back with multiple rushing touchdowns in a game since 2011 with two rushing scores … vs. No. 13 Auburn (Oct. 21): Suffered a lower leg fracture, which sidelined him for the rest of the season. HIGH SCHOOL: Tabbed the No. 4 all-purpose running back by Rivals and 247Sports … Four-star prospect, No. 7 player in the state of Tennessee and No. 169 player in the Class of 2017 by Rivals … Three-star prospect by ESPN, Scout and 247Sports … Pegged as the No. 27 running back in the class by Scout … Earned a final No. 188 prospect ranking in the class by 247Sports Composite … No. 10 prospect in Tennessee by 247Sports … Named one of the top 10 performers at The Opening … Rushed for 7,000 yards and 92 touchdowns over his career at St. George Academy … Named the male athlete of the year for Division 2 by The Commercial Appeal … Coached by David Carter … Earned Division 2A All-State honors from the Tennessee Sports Writers Association as a senior … Finalist for the Division II-A Mr. Back award … Named the District 2-A West 2 Player of the Year … Rushed for 1,940 yards on just 160 attempts for a 12.1 yard per carry average … Scored 29 touchdowns, including 27 on the ground … Hauled in eight receptions for 159 yards while also making 51 tackles to go along with 16 pass breakups on defense … Played in the 15th Annual AutoZone Liberty Bowl All-Star game … Two-time Tennessee Division 2-A Mr. Basketball winner (2015, 16) … As a junior, he was named Tennessee’s Mr. Football and Mr. Basketball in Division 2-A to become the first person in the first 31 years of both awards to win each in the same year … Rushed for an area-best 2,625 yards and 32 touchdowns … Averaged 10.9 yards per carry added five receiving TDs on 19 receptions … Rushed for 266 yards in the state title game against Northpoint … First of three straight seasons with over 1,000 yards rushing came as a sophomore in the form of 1,715 yards and 20 touchdowns … Became St. George’s all-time leading scorer in basketball during his senior season with 2,030 career points … Averaged 24.4 points, 6.5 assists and 2.8 steals per game … Shot 47.5 from the field and 3-point range, and 87 percent from the free-throw line … As a junior, averaged 24.6 points, five rebounds, three steals and 2.6 assists per game … Chose Arkansas over Michigan, Florida, Tennessee, Louisville, Oklahoma State, Mississippi State, South Carolina, Missouri, Vanderbilt, Illinois, Virginia, Purdue, Arizona and others. PERSONAL: Born on April 2, 1999 … Son of ChaToya and Aaron Hayden … Has two younger brothers: Dallan and Cullen … Father, Aaron, was running back at the University of Tennessee before being selected in the fourth round of the 1995 NFL Draft by the San Diego Chargers and played four seasons in the NFL … Undecided on a major.